After spending several weeks looking at bridge photos of New York City taken from a ferry, we are now looking at a bridge photo of Shanghai taken from a ferry. The ferries are an easier way of crossing the Huangpu River than walking over a bridge. Ferries cross at many points along the river, the fare is less than a yuan, and they cross the river in about five minutes. 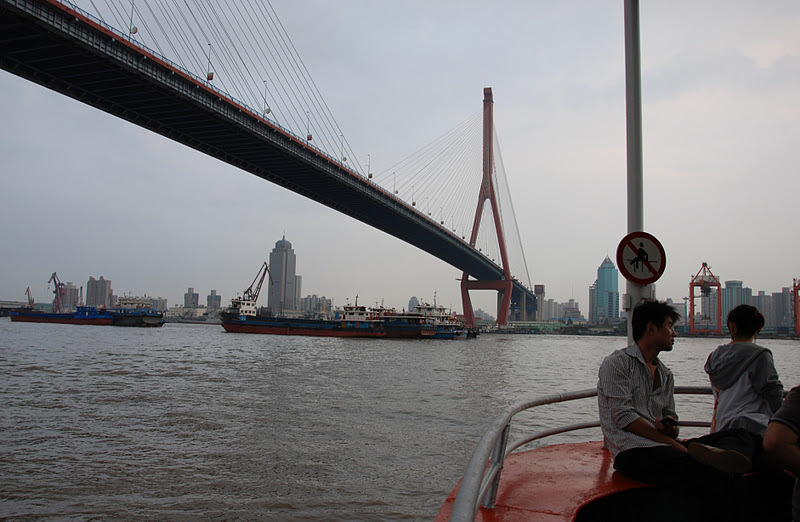 The Huangpu River is 114 km (71 miles) long and runs from the Yangtze River to the East China Sea. Its about 400 m (1300 ft) wide, 9 m (30 ft) deep, and flows through Shanghai. Shanghai is an interesting city. It was long dominated by Europe, conquered by Japan, and transformed after the war by the Cultural Revolution, and yet the people of Shanghai seem surprisingly relaxed and happy. The current population is about 20 million people (the population of New York City is under 10 million people). We'll begin our examination of Shanghai bridges at a point several miles east of the Bund (the former European part of the city). The Yangpu Bridge crosses the Huangpu River between the Yangpu District in Puxi and the Pudong New Area. It has six lanes and carries 100,000 vehicles a day (The George Washington Bridge across the Hudson has 14 lanes and carries 300,000 vehicles a day). The center span is 602 m (1975 ft) and the towers are 223 m (732 ft) tall. Vertical clearance for ships is about 48 m (158 ft). The entire viaduct is several km long, but the cable-stayed portion is 99m - 144m - 602m -144m - 99m. The bridge was completed in 1993 by the City of Shanghai with technical review by Holger S. Svensson. It was built by the Shanghai Huangpujiang Bridge Engineering Construction Company. It is a steel, cable stayed bridge with towers shaped like elongated letter A's (there's hopefully a better name for that shape). The cables are in what is called a semi-fan arrangement, which means the cables are attached high and close together on the towers and they aren't parallel. The deck is stiffened by relatively shallow plate girders. It has a composite (steel to concrete) deck. Shanghai's Bridges: Yangpu Bridge by Mark Yashinsky is licensed under a Creative Commons Attribution-NonCommercial-ShareAlike 3.0 United States License.